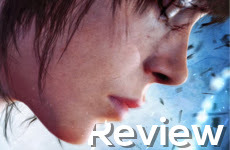 Beyond two souls is a game that tells the story of Jodie Holmes a girl with a psychic connection with a paranormal entity named Aiden. Through Aiden she can use different powers like possessing people's mind or choking them to death. Aiden can also move things around and travel through walls making Jodies job as a CIA agent a lot more useful in stealth scenarios. The game is told in a non-linear narrative, That means the player will be skipping through different ages of Jodie's life. It's unique to see this type of narrative used so often in a game and most people will disagree with me when I say it adds a different atmosphere to the game. Jumping from when Jodie was a small child to her mid twenties adds a few questions in between but usually settles the questions later on in the game. The game ends the way you want it to. Through the story you will meet different people and potential partners. In the end you will be given options that will give you an ending and you choose with whom to stay with and what to make of the story. The perspective of the player is third person with Jodie and first person when you switch to Aiden. It feels very smooth and is overall a good game with a heavy story line. Through the game you will be mostly in Jodie's shoes but that doesn't mean Aiden will be left out most of the time. Most of the game you will see Aiden and Jodie's relationship fluctuate from her hating him and annoyed by him to her showing signs of grief when Aiden makes his presence unknown. Aiden is a key part of Jodie's life and He ends up saving her from more than a few rough patches along the road. Overall I give the game a 4.5. I think the game is very story driven and emotional I'm not saying that's a bad thing but the game doesn't really give you much to be happy about. The surroundings are very beautiful and very responsive with what's going on around Jodie. The controls are a bit off at first but you get used to them very fast and I didn't really find myself trying to remember what button did what. The game is worth the buy and worth the time. Definitely will be remembered for years to come.